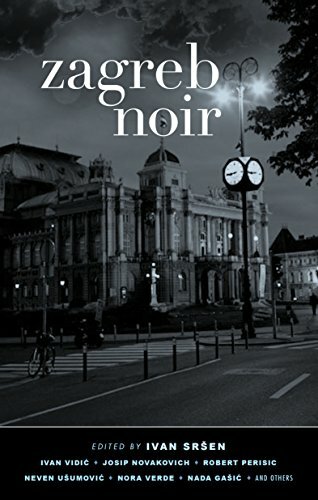 Zagreb Noir, edited by Ivan Sršen, is yet another international addition to the long-running Akashic Noir series. The capital of the Republic of Croatia, Zagreb becomes the focus for 14 short stories. While the Zagreb locations and the authors will be unfamiliar to an American audience, the stories won't. As with previous installments, Akashic lets the editor play fast and loose with the definition of “noir.” Every city and every culture has its own particular darkness. This darkness usually involves the collision of national and local histories, individual bad decisions, and keeping up appearances. Zagreb's noirish underbelly comes from a new nation familiar with both war and war crimes. Mr. Sršen's handpicked selections are anything but ordinary. History and the inevitable violence it brings are never far away in these short stories. “Night Vision” by Pero Kvesić has its narrator unleash a tirade, “This part of town is cursed! Have you ever thought about the houses we live in and who lived in them before? When Austria-Hungary fell apart, all those nobles and Austro-Hungarian generals went off to Vienna or Budapest. When the old Yugoslavia fell apart, the Serbian merchants went off to Belgrade. Many of the mansions belonged to rich Jews. The Ustashas put them in camps and moved into houses and apartments where there were still warm bedsheets, unironed laundry, and closets full of clothes. Then the Partisans came, and the Ustashas fled. If they didn't make it to South America, they probably died at Bleiburg. And all that in less than seventy years! Now we're here, but I don't know whether it'll be for long . . . This part of town is on the windward side of history and might get blown away.” Despite the weight of history, the narrator, who has the power to see in the dark, sides with the better angels of his nature and uses his power to help out a family in need. Other stories include a descent into paranoia, a she-warrior anarchist battling racist skinheads and misogynistic cops, and a football fan driven to mob-fueled barbarism. The football fan, in Josip Novakovich's “Crossbar,” is an ordinary architect in his professional life. But football and the cheering crowds do something to him. “Ordinarily I was a civilized denizen of Zagreb, an architect with a taste of macchiato and single malts, and at the beginning of the match I was still a civilized human, but now, by the end, I had taken off my shirt and was hollering for blood and retribution with my tribesmen.” The match takes a turn for the worse and the thin veneer of civilization rips asunder. These short stories reveal how fragile the barrier is between civilization and barbarism. With the migrant crisis challenging the European leadership to search for a feasible solution to the Syrian catastrophe, Zagreb again comes into focus. “Wiener schnitzel” by Ivan Sršen explores of the dismal and pathetic lives on both sides of the crisis. The story weaves together the events involving a criminal lowlife and Muslim refugees. Like their fugitive counterparts, the human traffickers find themselves in a situation where escape becomes a futile quest. All the human trafficker wants is an opportunity to taste Wiener schnitzel. But even that evades his efforts. Despite the confusing patchwork of nations, ethnicities, and religions, the former Yugoslavia and Zagreb can still create a location where universal themes are expressed. Zagreb Noir is about those universal themes: stability, love, and peace. Unfortunately, noir is about how people fail, make bad decisions, or become prey to their worst impulses.